The important decoration of an Indian bride during her wedding day is the Indian bridal makeup that she wears to complement her outfit. Bridal makeup consists of thick applications of makeup with the foundation as the first layer. Subsequent layers of the makeup are smoothed on to match the skin tone of the bride. Heavy bridal makeup is necessary to set off the beauty of the bride under the scrutiny of guests, relatives and friends during her wedding ceremony. 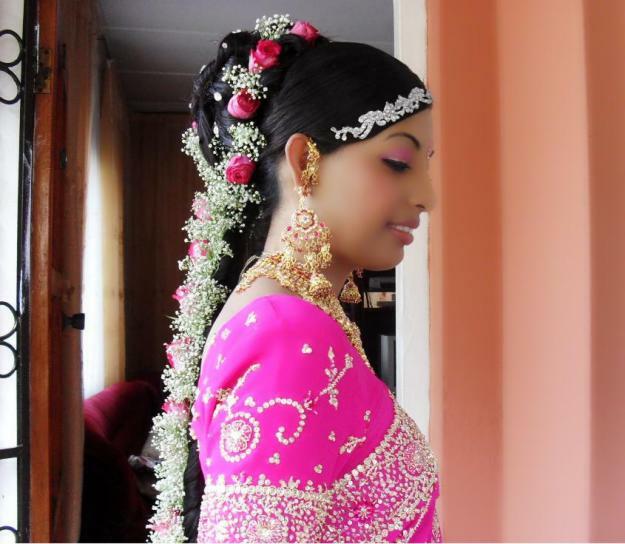 Very often, Indian bridal makeup for modern brides will be applied by makeup artists who are adept at color co-ordination. They work with a palette of different colors that take account of the color of the bride’s outfit as well as her skin tone. Lighter shades of powder are used for light facial skin tones to ensure that the face does not look pasty. For darker skin tones, caramel or coffee tones are generously used on the face. Indian bridal makeup also serves to hide the blemishes on the skin such as dark circles around the eyes or brown spots on the faces. Acne and other skin disorders may be heightened with the use of bridal makeup. However, special medicated makeup is used for skin problems. Bridal makeup sweeps extravagant colors on cheeks, lips and eye lids to give the bride the astonishing countenance of a celebrity in her regal sari. The mainstay of Indian bridal makeup is the use of henna to decorate the hands of brides. Henna is a brown colored paste that is used to draw designs, usually floral, on the palms and back of the hands of traditional Indian brides. This practice hails from ancient times when modern makeup techniques were not available. Henna is also used to highlight the finger tips of brides and to color the finger nails. The henna stain will remain on the skin for several weeks but will eventually wash off in time. Henna is a non toxic paste made from the juices of henna leaves. The henna dye is also used to lighten hair from jet black to a more dark brown color. When applying Indian bridal makeup, be sure to use heavy applications to offset your lovely brocaded sari. Decorate your hands with henna and spot your eyebrows for a glamorous look!